To boost your chances of getting to the interview stage, your resume should have clean, visually appealing formatting and quickly draw attention to your strongest qualifications. Our excellent resume templates can assist you in achieving this goal, with professional advice for structure and content in a vast range of styles. Not only that, we provide you with many examples to follow while crafting your own version. Why Use Excellent Resume Templates? The Bureau of Labor Statistics predicts substantial job growth in many industries between now and 2026. Some cutting-edge vocations, such as wind turbine service technicians, will see very explosive increases. Meanwhile, projections for healthcare occupations range between 29% and 47%. Even if your field isn’t one that’s expected to see a huge boom in employment, you still require a strong resume to stand out from the pack. Should you stick to only one page for your resume, or do you need two? The answer to that question depends on your industry, level of experience, or specific directions from the job posting. 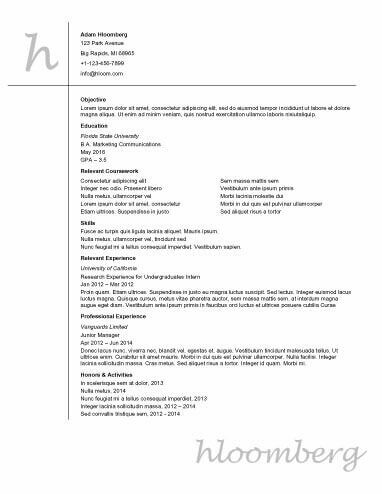 When you need to keep your document to a single page, use our one-page excellent resume templates. You’ll learn how to put your most pertinent qualifications front and center in a space-saving format with aesthetic appeal. Don’t think that the chronological resume format has gone extinct. In fact, it’s a great way to clearly delineate your work experience as well as document past achievements that saved past employers money, gained them additional revenue, or resulted in greater efficiency. Our chronological excellent resume templates show you how to maximize the details of your career history in a straightforward layout. Many recruiters depend on applicant tracking systems to simplify their candidate searches. As The Muse explains, these scan incoming resumes for keywords from the job posting, rank these documents, and forward the most qualified ones for further review. Check out our ATS excellent resume templates to see how you can adopt simple, uncomplicated formatting and keyword optimization to help your resume successfully pass an ATS and make it onto a recruiter’s desk. Don’t underestimate the power of a basic, simple resume format. If you’re in a conservative field, such as law or finance, your document’s look and feel demonstrates professionalism. In creative fields, such as web development or graphic design, an attractive resume with a minimalist structure shows off your skills and prudent judgement. Review our basic and simple excellent resume templates for advice on clean design with compelling content. Like any other tools you’d use in your job, you need to select the best resume format to accomplish your desired objectives. Artistic professionals, such as web designers, performing artists, fashion designers, and marketing consultants, can benefit from our creative excellent resume templates. Learn how to tool your document’s structure to show off your unique skill sets, testify that you understand an employer’s workplace culture, and prove that you’d be a great fit. Start your resume creation off on the right foot with our excellent resume templates, which contain helpful advice and hacks for formatting and content. While you’re at it, don’t lose sight of resume writing best practices. Consult our guide for composing compelling and persuasive text, and be sure to include the following essential sections in your own document. Name: You have some leeway with how you list your name, as Business Insider reveals. For common names, consider including a middle initial or a professional-sounding variant of your first name. Just make sure it matches your professional social media profiles. Email address: Choose an address that has some form of your legal name. Also, leave "dated" servers such as AOL or Hotmail back in the 90s. Phone number: Most experts advise using a cellphone number with a professional-sounding voicemail greeting. Mailing address: You only need to include your city and state. Should you adopt the newer summary statement or go with the classic objective statement? That depends on many factors, including your level of experience and your career goals. There are good arguments for each one, and you can leverage both with compelling language, keyword inclusion, and other strategic practices. Summary Statement: Use this as a "quick pitch" selling your most relevant skills and experience upfront. The Muse recommends using a few strong, pithy phrases that either encapsulate your professional "brand" or bring related transferable skills to a recruiter’s immediate attention. Keep this section to no more than four to six phrases or bullet points. Objective Statement: The prevailing thought is that the objective statement is obsolete, but that doesn’t mean you can’t use it to pack a powerful punch. The Muse suggests that career-changers should mention specific pertinent abilities and expertise in this section. Be a Superstar: Go beyond your basic job duties. List accomplishments that brought value to your employers and quantifiable metrics whenever possible. Action Verbs: Dynamic verbs show recruiters a clear picture of what you’ve done. If you need help with your word choices, The Muse has an exhaustive list. We’ve given you some excellent resume templates and a cache of best practices to help you get started. Along with these, our resume builder offers powerful tools and functionality to get a stellar, professional-looking document. Not only that, it gives you a ton of bonus features to make your job search easier.